The fall nectar flow is beginning to slow down and colder temperature are going to be setting in soon. You have pulled off your last honey frames that you plan to extract for the year and left your bees a good 50-60 lbs of honey for them to survive on through winter. Even after extracting there is still a little bit of honey left on the frames that you want to give back to your bees. What better way to give it back to your bees then set it right next to the hive for them to clean out the honey....right?This is not what you want to do. Honey/nectar will draw in other bees and insects. 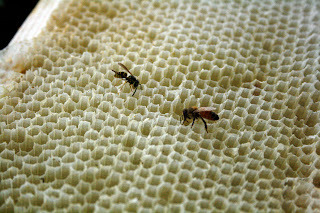 The smell will lure them to the exposed honey and this can cause a robbing frenzy in which bees will physically fight in order to obtain the honey. 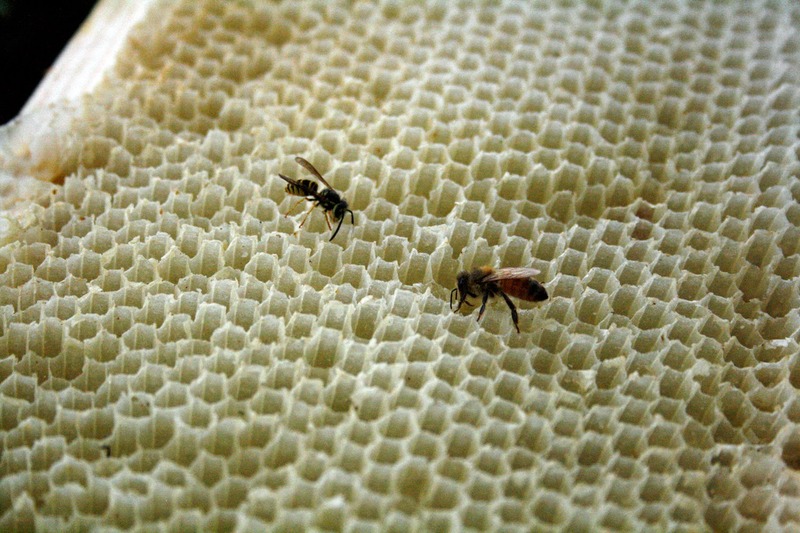 Once they have cleaned out the honey from the frames you extracted, they will begin robbing the next source of food. The next source could be your hive! 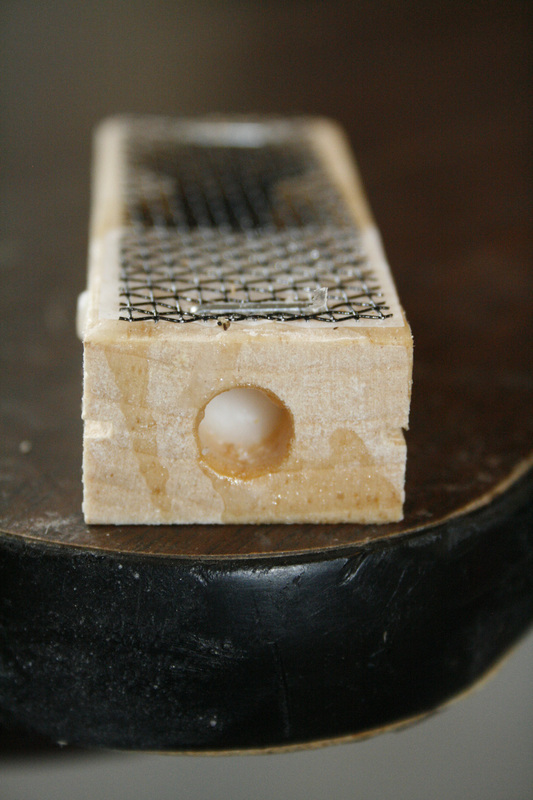 Your bees will do a much better job cleaning the frames than you will ever be able to but what is the best way? 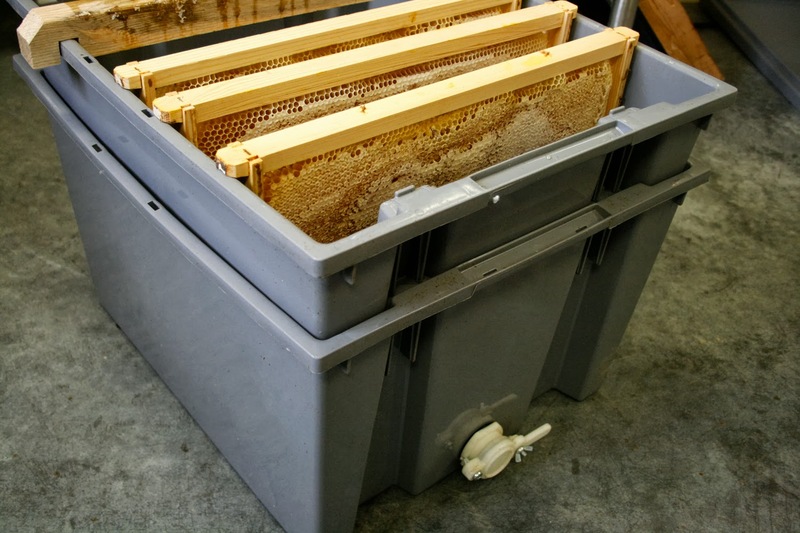 Some beekeepers will place their honey supers back onto the hive for a week. This will give the bees enough time to clean the comb in order to begin building up the honey stores again. Remove your top but leave your inner cover on. 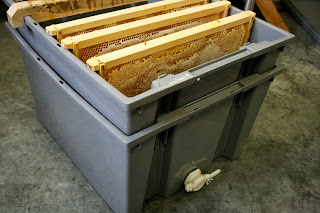 Place your 'dirty' frames above your inner cover and place the top back onto the hive. Give it close to a week before trying to remove the supers. 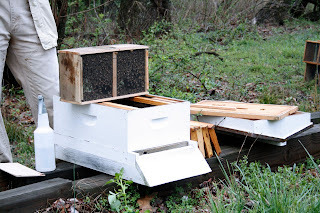 If you do not want to go back into your hive (you called it quits for the season and you want to leave them closed up) you can place the supers out in the open for your bees to clean up. You will want to keep the supers at least 200' away from your bee yard. Again, this can cause a robbing frenzy that can lead back to your hives... so the further away it is, the better. Beekeepers are beginning to install their bee packages. Here are videos that will explain a package and go over the steps of installing your packages. This can be an exciting experience and knowing what to do before installing your packages will prepare you for the task at hand. We want you to feel comfortable while installing your package. 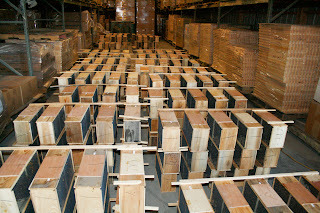 Installing your bees can be a thrill and during the activity certain steps must be carried out. Remember that the cork must be removed from the candy end. Removing the cork from the non-candy end will release the queen prematurely and your colony will not have accepted her yet. 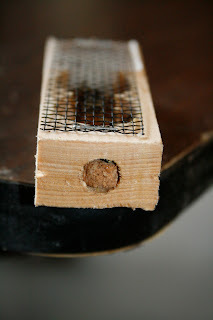 Once your bees have been installed, a feeder must be applied. 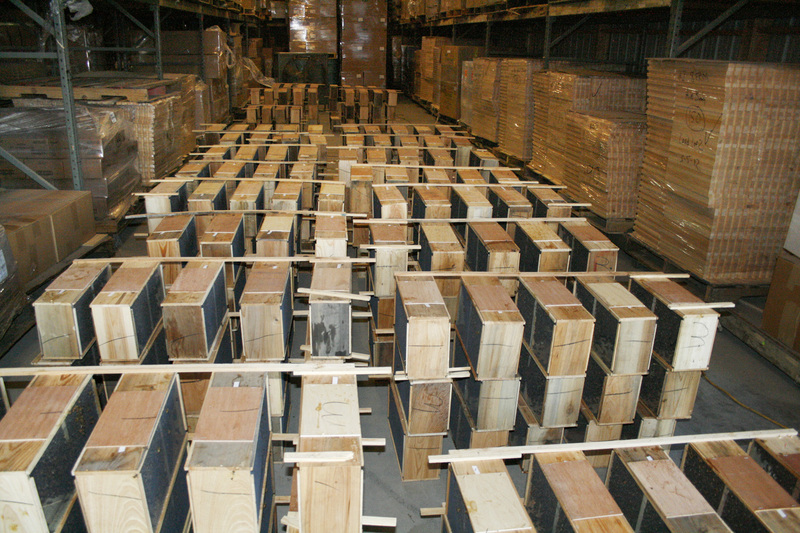 Depending on the weather and temperatures outside, using an entrance feeder or a division board feeder are most common. The feed must be easily accessible by your colony and checked on regularly. 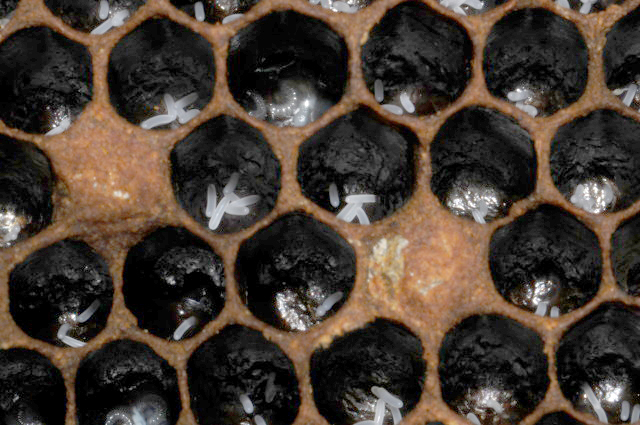 The colony is not yet established and will not be able to forage for pollen or nectar. Keep the feeder on until your bees are able to sustain themselves (even then, having a feeder on for that rainy day is recommended). If temperatures do not drop below freezing, a 1:1 ratio of sugar to water is an acceptable feed. The sugar water mixture will help stimulate colony growth. If colder weather is forcasted, feed with fondant or other semi-moist, hard feed. We had our first Bee Pick Up Day at the Bee Farm. We know everyone that came to pick up their bees were worried about the colder temperatures and what to do about installing their packages. Ideally, a package of bees should not remain in the package for more than 4-5 days. Keep in mind that the bees will have been in the package for about a day before they were picked up at the Bee Farm. (a) Cold (highs of 45° or less) for more than 4-5 days, it will be best to install the bees. (b) Cold, but forecasted for just a day or two, keep the bees in a cool dark place, such as a garage. Be sure to lightly mist the bees with sugar water twice a day. If you see increased bee mortality in the bottom of the package, install the package. When installing bees in cold weather, be careful not to excessively wet them down with sugar water. It is best to shake the bees from the package so that they can cluster around the queen to keep her warm. The passive method of installation is not suggested as the bees may cluster in the package rather than round the queen. (b) If you have drawn comb which doesn’t have honey, you can lay the frame flat and sprinkle sugar into the cells until they are full. Mist the sugar just a little so it gets sticky and doesn’t fall out when you stand the frame up. Now do the other side. Frames loaded with sugar can be hung in the hive and used for food by the bees. (c) If you don’t have any drawn comb, you can apply a fondant to the top bars, or better, use a Fondant Feeder (an empty frame filled with fondant and wrapped with a hardware cloth). 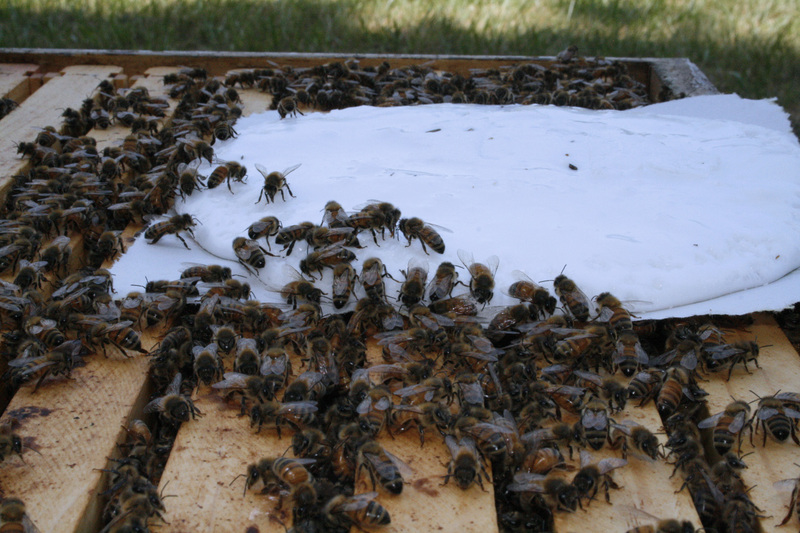 The bees can cluster around the fondant and use it as a food source.